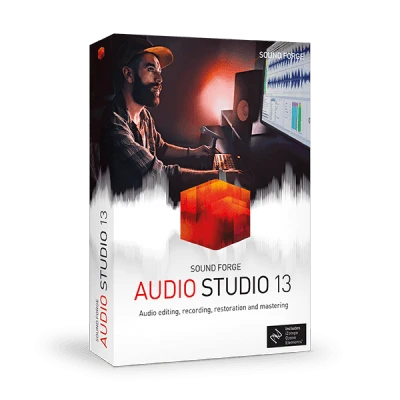 The new SOUND FORGE Audio Studio 13 offers an array of audio editing functions for recording, editing, restoration or mastering. Record podcasts in high-resolution quality, edit your audio files with ease using the Event Tool, restore and digitize your old records and tapes, or add a high quality sheen with professional effects and mastering tools. 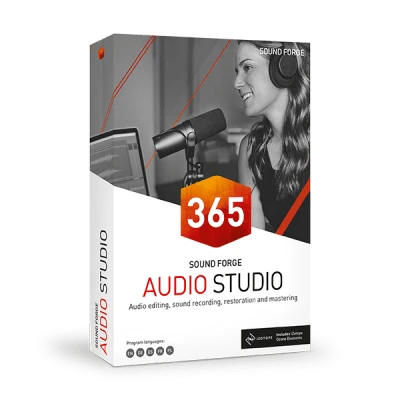 SOUND FORGE Audio Studio records in high-resolution audio so is great for producing everything from professional podcasts to complete band recordings. Simply connect a microphone to your audio interface to capture top-quality, 32-bit/384kHz recordings in an instant. It's easy to produce professional podcasts. Connect your microphone or mixer line out and use familiar editing and mixing tools to produce perfect-sounding podcasts. See your audio recordings come alive within SOUND FORGE Audio Studio's interface. Each recording is revealed in intricate detail as a live waveform that updates according to the input signal. The software is also compatible with low latency ASIO devices so you can enjoy real time audio monitoring. You get total audio editing power thanks to a 64-bit engine, 6 channels of audio and a suite of top-notch, professional effects. These plug-ins will simply inspire your creativity and include Chorus, Flanger, Delay, Distortion, Amplitude Modulation, Dynamics, EQ, Gate, Limiter, Stutter and many more. Make quick and easy, non-destructive edits to your audio files with the new Event Tool. Use the Event tool to edit audio events like cuts and their crossfades so removing any noise. With up to six channels of audio, your editing possibilities are no longer limited to 2-channel stereo. Now you can explore the wonders of surround sound with full support for 5.1 Surround files. SOUND FORGE Audio Studio utilises 64-bit technology to make the most of your computer's processing power. This means it can easily handle even the most advanced projects, packed with effects, but still deliver playback with much lower latencies. Takes your audio on a journey through time with Bitmachine! This effect employs the best bit- and sample-rate reduction as well as a downstream analogue filter to produce a great 'Lo-fi' sound so popular in the 80s. Create a wider and deeper sound with the Chorus effect. This popular effect is often used on guitars and synth to fatten up the sounds, therefore creating the illusion of a thicker multitrack recording. Analog Delay offers more creative results than standard, run-of-the-mill delays. You can easily adjust the delay times while you play your instruments or go for more typical band echo sounds, all completely artefact free. This is a great, high-gain distortion effect, perfect for crunchy lead guitar sounds. Featuring a complete modelled tube preamp circuit, this is great for creating 'British' amp sounds and for laying down guitar tracks quickly and easily. An excellent modulation effect which includes different filter types and modulation times to control the frequency response of a modulation source. It's a flexible effect with a wide range of uses, typically to create the famous 'wah' effect on guitars. This is a more dramatic modulation effect that can introduce a swirling sound often used on guitar and drum sounds. It includes various types of flanging sounds, including a comb-filter effect often used in techno and house. High-quality restoration tools enable you to restore and convert your old vinyl and tapes to high quality digital masters, while top-end tools mean you can master your audio and mixes for radio broadcast or on-line streaming. It's easy to clean up your audio recordings with the audio restoration tool. It can detect and remove clicks and the kind of static noise common in air conditioners, amplifiers and other electrical gear. Repair and digitize your favourite records and tapes with the vinyl recording and restoration tool. You can easily remove vinyl crackle and boost volume levels, and then burn a CD or convert the audio to any popular format including MP3, FLAC and Ogg Vorbis. Now you can work with both high quality sound and video! With all the most popular video formats supported, you can do everything from creating a soundtrack to restoring and editing an existing one. It's easier than ever to compile tracks for a CD master. Use the 'open and paste' command to select single or multiple tracks and add these automatically – including track markers – to your CD. SOUND FORGE Audio Studio imports and exports audio files in all of the common formats including WAV, AIFF, MP3, MUS, AAC, FLAC, OGG, WMA, ASF, W64, CDA, RAW and VOX. Ozone Elements helps you prepare mixes that sound great wherever they are played, be that on the radio or streaming on-line. It includes professionally-designed presets for different genres so you get a crystal-clear and powerful sound, in whatever style of music you make. A Mastering Assistant 'suggests' processor settings which you can then fine tune to produce perfect masters.